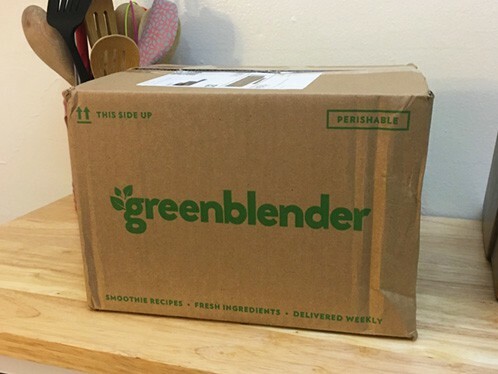 Green Blender Review: The Best Fresh Smoothie Subscription Available? Are you crazy for smoothies, but hate the hassle of buying and preparing the ingredients every time you want one? If so, it’s safe to say you aren’t alone! The good news is that Green Blender totally feels your frustration. They aim to help you make delicious smoothies faster and easier than ever before. 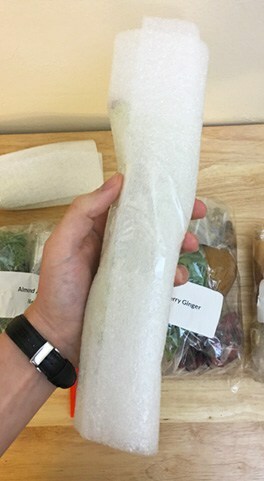 Instead of the usual meal delivery service that provides you with dinner options, they’re sending you farm-fresh ingredients for amazing, superfood smoothies. Everything gets delivered straight to your door, making it simple to get your daily smoothie fix. It’s going to be a must-have for all the smoothie lovers out there! Click to use code “GBSAVE10” for $10 off! If you’re ready to get fresh smoothie ingredients delivered to you, it’s time to get started with Green Blender. The best thing is, it’s easy to place your first order. To begin, you just need to enter your email address and zip code. Sharing your zip code ensures that you are in Green Blender’s delivery area and it will also show you available delivery options at checkout. Next, you’ll need to choose the plan that best suits your needs. There are three options to choose from here. They offer a Fresh Start plan, which is a week-to-week subscription. This is ideal for someone who isn’t absolutely sure about Green Blender and wants to give it a try first before committing to a longer subscription. If you’re ready to go all in, you can choose between the Monthly Challenge plan or the Healthy Habit plan. The Monthly Challenge plan is a four box subscription, while the Healthy Habit plan is a 12 box subscription. No matter which option you choose, your plan will renew automatically. You may skip a week or cancel at any time if needed. Once you’ve chosen the plan that’s right for you, you’ll be prompted to enter your shipping information and your billing details. After you’ve done that and submitted your order, you just have to sit back and wait for your first Green Blender order to arrive! Each week, you can expect to recipe original recipes from Green Blender as well as the pre-portioned ingredients needed to make the smoothies. You’ll find all of the ingredients needed to make five different recipes, which provide you with two servings each. This means you’ll have a total of 10 smoothie servings and plenty to enjoy. All of our Green Blender ingredients. 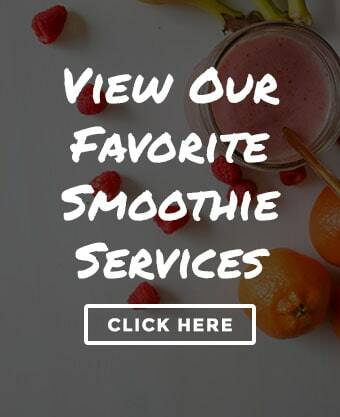 For a company that’s dedicated to providing you with delicious, nutritious smoothies, it should come as no surprise that they have a great selection to choose from. There’s something for everyone to enjoy with their recipes. Plus, they’ve made it incredibly easy to find the right smoothie for you, with the ability to filter recipes by benefit. You can sort their smoothie recipes by the following options: high protein, energy, glow, immune boosting, low calorie, anti-inflammatory, calm, low sugar, and high fiber. Some of the smoothies you’ll find on their menu include: Protein Peanut Butter, Grape Chia Refresh, Almond Berry, Apple Ginger Lemonade, Chai Green Matcha, Spiced Carrot Cake, Chocolate Maca Milkshake, and even a Pumpkin Spiced Matcha Latte. You’ll even find their Green Ginger Shot Detox, Intoxicating Apple Walnut smoothie, Radiant Sweet Potato, Pineapple Coconut Cream, and Kiwi Crush. With pages upon pages of recipes on the Green Blender website, there’s a plethora of great smoothies to choose from. You’ll have a hard time choosing which on is your favorite! Green Blender delivers to most of the contiguous United States, but some ares are unfortunately outside of their delivery zone. Even if your state is included in their delivery area, your particular zip code might be excluded. When you go to place an order with Green Blender, you’ll be prompted to enter your zip code and this will alert you to whether or not you’re able to receive a delivery from them. 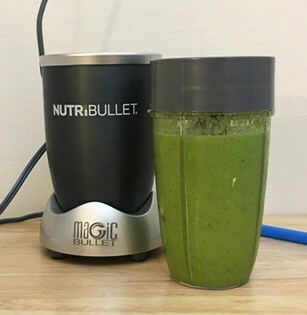 At this time, Green Blender delivers to most parts of the following states: Alabama, Arizona, Arkansas, California, Colorado, Connecticut, Delaware, Florida, Georgia, Idaho, Illinois, Indiana, Iowa, Kansas, Kentucky, Louisiana, Maine, Maryland, Massachusetts, Michigan, Mississippi, Missouri, Nebraska, Nevada, New Hampshire, New Jersey, New Mexico, New York, North Carolina, Ohio, Oklahoma, Oregon, Pennsylvania, Rhode Island, South Carolina, Tennessee, Texas, Utah, Vermont, Virginia, Washington, Washington D.C., West Virginia, Wisconsin, and Wyoming. If your state isn’t on that list or Green Blender doesn’t yet reach your zip code, you can always check back at a later date. Their website states they’re quickly expanding and they’re planning to reach more areas. So, all hope isn’t lost if you aren’t currently in their delivery area! On the day of your delivery, you can expect your box to arrive between 9 AM and 8 PM. It ultimately depends on the courier who is making the delivery. You will be provided with tracking information so you can see when it’s out for delivery to your neighborhood. There’s no need to be home to receive the delivery either. A signature is not required to accept the package, so it will be left in a safe spot at your residence. If you’d like to add special delivery instructions for your order, you can contact Green Blender to do so. You’ll want to make sure you send over any instructions at least five days before your next delivery is scheduled to arrive to ensure that information can be passed onto the courier. A majority of the packaging materials that Green Blender uses can either be reused or recycled, which they encourage their customers to do. It’s all part of their attempt to be eco-friendly and lower their carbon footprint. For this reason, most items can be recycled at your local recycling center. The cardboard and kraft paper can be broken down and then recycled. If you have a curbside recycling pick-up in your neighborhood, this is acceptable to leave outside. You can also take it to your local recycling center. The same goes for the plastic and deli containers, which are also recyclable. Fruit well packaged to prevent damage. Green Blender uses insulated box liners made from cotton and denim, which is from post-consumer waste. These are made mostly of already recycled materials. Their website states you can remove the outer plastic liner and recycle that at any local facility that accepts #4 plastic film. The fabric liner can be disposed of with your normal waste, along with the foil liners. The plastic bags and film in your package can also be recycled at a facility that accepts #4 plastic film. And finally, the ice packs can be reused, recycled, or even donated. If you’d like the recycle them, you can cut the corner of the pack and drain the non-toxic gel into your garbage. Next, rinse out the bag and drop it off at a recycling facility that accepts #4 plastic film. Alternatively, you can keep the ice packs and reuse them yourself or Green Blender suggests donating them to a charitable organization that would find them useful. Green Blender’s website states that they source from organic farms, urban and local farms, green markets, and vendors who use sustainable practices whenever possible. They’re committed to providing their customers with high-quality ingredients they can feel good about eating. Everything you receive will also be non-GMO. If Green Blender is ever unable to source an organic version of an ingredient, they may include a conventional or minimally treated substitute. The ingredients you receive will be fresh upon arrival. They’re meant to last for the week in which they’ve been delivered. The key is to make sure you’ve properly stored all of your ingredients to promote their longevity. Green Blender has plenty of storage suggestions on their website to help you out. Once you’ve blended a smoothie, you can keep it fresh for up to 24 hours by storing it in a sealed glass or plastic container and placing it in your refrigerator. If you have any leftover smoothie, you can also freeze it to extend its life even longer. 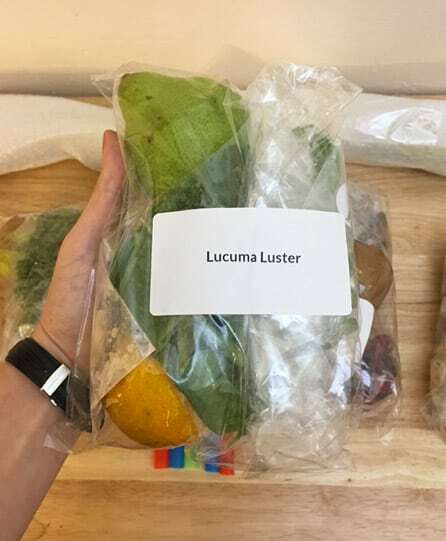 Making our Green Blender “Lucuma Luster” smoothie. There’s no denying that Green Blender has made it incredibly easy to make yourself a tasty smoothie. Because they send you pre-portioned ingredients, there’s never any need to measure anything. That means blending up your next smoothie is easier than ever before. The most work you’ll have to do is washing the ingredients and occasionally peeling certain items. You will be expected to have a blender in your home since you’ll obviously need something to turn your ingredients into a smoothie. 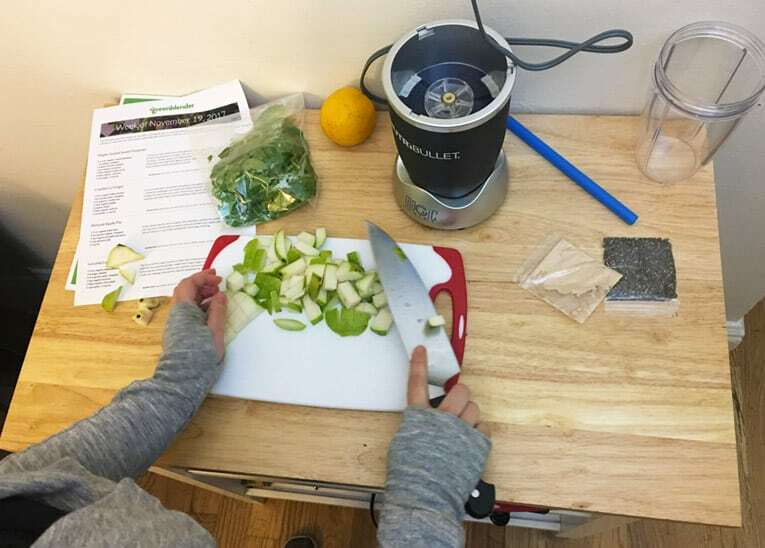 Green Blender also recommends having a knife or vegetable peeler, as this may be required for some of the recipes you receive. However, that’s really the most work you’ll have to do. Once you’ve tossed everything into the blender, you can blend it up and have your smoothie in no time. It really takes less than five minutes to get everything ready for you to enjoy! With a seemingly endless list of smoothies to choose from, there’s something to suit everyone’s tastes at Green Blender. If you’re a fan of more classic smoothie recipes, you’ll love the creamy Protein Peanut Butter smoothie. Even though it’s packed with baby spinach, you’ll never know because you’ll be too busy enjoying that peanut butter and banana flavor. Their Strawberry Orange Spritzer is another great smoothie and a perfect one to start your morning. It’s refreshing and will leave you feeling energized and ready to tackle your day. It has one orange, strawberries, flaxseed, and also some mini peppers that provide an added kick. With antioxidants and fiber, it’s a great smoothie to treat yourself to. Another one that’s great for a refresher is the Cucumber Limeade, which is perfect for those hot summertime days to help cool you off. For those that can’t resist the Pumpkin Spice Latte, you’ll love the Pumpkin Spiced Matcha Latte they’ve created. It’s delicious and makes the perfect drink for fall. Packed with butternut squash, pumpkin spice, banana, matcha, water and ice, you’re sure to love it. If apple is more your thing, you’ll love the delicious flavor of the Autumn Apple smoothie. With yellow squash, one pear, walnuts, apple, and maple syrup, it’s the perfect smoothie to indulge in during the fall and winter months especially. The price of your Green Blender subscription will depend on which plan you choose to purchase. You can go with the Fresh Start, week-by-week plan, which costs $49 total. With this plan, you’re looking at $4.90 per serving with your smoothies. Next, you have the option of the Monthly Challenge plan which is a four box subscription. This plan comes to $176 total, which will cost $4.40 per serving. And finally, there’s the 12 box Healthy Habit plan that costs $468 total and comes to $3.90 per serving. The savings obviously increase when purchasing a longer subscription. Shipping is always free with Green Blender, so you don’t have to worry about paying any additional fees for that! Each plan provides you with five recipes per box, with two servings for each recipe. That means you’ll have a total of 10 smoothie servings to enjoy. If the price seems off-putting, you have to remember that you’re getting pre-portioned ingredients to cut down on waste. The reality is, many of us buy smoothie ingredients and fail to use everything we’ve purchased. 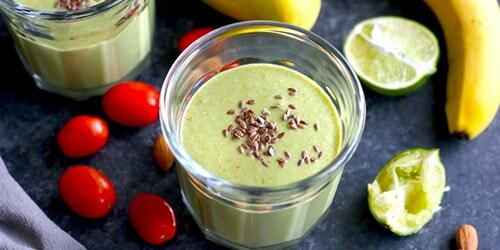 Green Blender’s service helps to cut down on that waste by giving you just what you need for your smoothie recipes. If you’re someone who enjoys a fresh smoothie but hates the hassle of finding recipes and preparing ingredients, let Green Blender come to your rescue. With their smoothie delivery service, you can enjoy a great smoothie any time you want with little preparation on your end. All you need to do is wash and prep your ingredients, toss them in the blender, and it’s ready to go! There simply isn’t an easier way to get your smoothie fix. The best part is, Green Blender is committed to providing fresh, quality ingredients. Since they’re providing the ingredients for the smoothie and you’re making it, you’ll always know exactly what goes into it. That’s something that doesn’t happen at many of the chain smoothie shops out there. You can feel good about all the smoothies you make with Green Blender! Tried both green blender and daily harvest… have to say that I slightly prefer green blender because they have a ton of variety. Only downside is the fact that fruit doesn’t last as long because it’s not frozen. Would you say green blender is healthier? I’m trying to lose some weight and doctor is saying to stick to fresh vegetables and fruits. I’m not looking for anything that has sugar in it! I wouldn’t say it’s necessarily healthier than Daily Harvest but it does offer fresh fruits and vegetables rather than frozen. You can also control what smoothies you’d like to receive and there’s tons of variety. Check out what they have to offer on their site and see if it fits with the diet you’re looking to go with. Green Blender or Daily Harvest for a kid? My nephew needs to eat healthy foods. We’re trying everything. Both are great options. 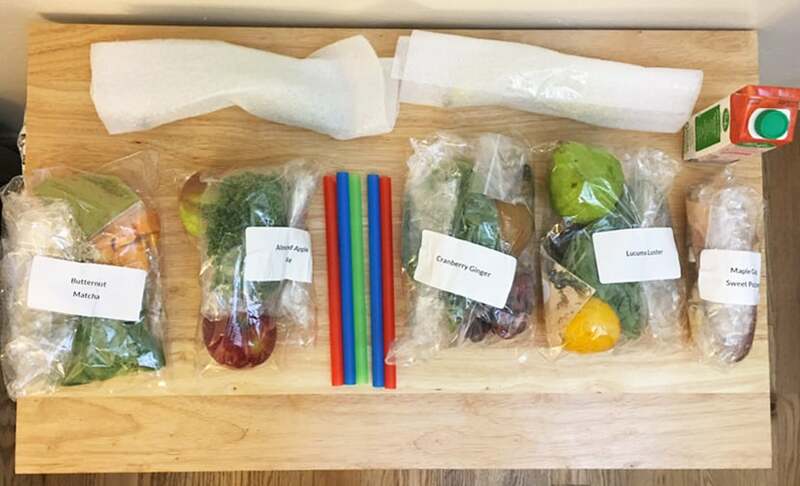 Green Blender could be more “fun” for a child because they have the ability to blend each fruit and vegetable. This could be a learning experience too, where they understand the role each plays in their own nutrition.